Earlier this year Auckland Council adopted the new spatial plan – the Auckland Plan. Among its many priorities it seeks to grow a business-friendly, well-functioning city. Sounds good – but it also acknowledges the challenge that Auckland is still primarily an inwardly-focused city, with an economy driven by its own consumption and offering primarily domestic services. Employment and economic activity is vital to the “liveability” of Auckland and the Auckland Plan sets laudable goals including economic transformation based on high innovation and a business-friendly environment – the question is how? Sorry, I don’t have the complete answer but as a planner I can say part of that answer will be the planning tools that govern our use and development of resources including land, water and air. The proposed Unitary Plan is a key part of the “toolkit” to enable this growth and transformation. It will also be the regulatory tool to achieve all the priority targets of the broader Auckland Plan. Auckland needs to make some hard decisions about where we want business growth and how we set up an appropriate regulatory framework to facilitate it. It’s daunting, but nevertheless an exciting opportunity to truly gather the benefits of a unified planning regime by narrowing the gap we have often seen between district planning (which governs land uses or where activities should go) and regional planning (which manages activities in terms of “emissions” (air, water and land). As the Auckland Plan says, being “business-friendly” will be measured by explicit attempts to reduce the regulatory barriers and uncertainties of commercial activity to stimulate and support local business growth, local business retention and the attraction of new business. We should welcome council’s announcement that, over November, wider community engagement on initial proposals for the Unitary Plan will be undertaken – looking particularly at where we work, where we live and what we value. Aucklanders should engage through this process, whether as individuals, communities or businesses. In particular the priority to become business-friendly needs commerce and industry to engage on the Unitary Plan. For business, it will be critically important that the Auckland Forum and People’s Panel put their minds not just to the businesses of today, but the demands of and needs to deliver the business outcomes we aspire to for tomorrow. It isn’t as simple as just deciding where we work, it is also deciding how, through the Unitary Plan, we enable business to thrive. The Auckland Plan tells us that the Auckland of 2041 needs to accommodate 40 per cent more employees than currently work within its boundaries. The targets identified for business are to provide at least 1400ha of additional business land, with 6,000,000m2 of new industrial floor space. The challenge to Auckland (the council and Aucklanders) is to make choices now about where this land should be and to put in place the framework to truly enable business growth. 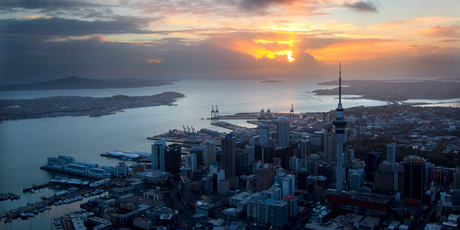 The issues facing Auckland in terms of business relate to costs and in particular land, transport and compliance costs. Notwithstanding the need to manage adverse environmental effects, often the plans and rules that are set out in the planning framework are seen as a “threat” (of cost, risk or outcome) to business. For Auckland to be business-friendly, methods and provisions will need to reflect this in the Unitary Plan. How does the spread and dispersion of business activity work? How do we enable industry/employers to locate appropriately – where people can easily get to work? How do we balance “not in my backyard” with “accessibility” to employment? From an emissions perspective it might sound sensible to locate industry in one place – but then you don’t have people working close to where they live. If they have to drive there that creates emissions and inefficiencies. Is this an opportunity to better streamline the industrial discharge consent processes with the decisions on land use (where they are located)? Can the Unitary Plan integrate regional discharges with the land use elements? Should land for industrial business use be matched with a commensurate discharges regime? For instance, can we smooth the “traditional” conflicts between the environmental discharge consenting processes “holding up” the process where there is a permitted land use? How will our industrial activities integrate and relate to our metropolitan and town centres and what does this mean for the increasing residential intensification? What is the role or relationship of Auckland to its neighbouring cities in terms of employment? Have we considered the dispersion of business activities in a trans-regional context – how do we manage business needs in relation to Hamilton, Tauranga, or Whangarei? In considering our business stakeholders, are we looking to the future? The plan needs to provide for future business aspirations. Existing businesses are often taken into account through industry forums and panels – are we capturing our aspirations for future business growth and development? Lack of certainty is one of the critical “planning barriers” to investment and growth – what trade-offs are there? Can we create a plan that will then enable businesses to develop and grow with certainty? Can we enable business to work within clear, appropriate parameters? The Unitary Plan creates an environment where this kind of question can be considered upfront, with the opportunity for the balancing of the economic, social, environmental and cultural values to be made now and not later. The Government has promulgated a “single-tier” process for hearing the submissions on the Unitary Plan, with limited appeal rights. This means that for all stakeholders, including industry and business, the engagement process preceding public notification of the Plan is critical as there is only one chance to participate. Using the outcomes-focused philosophy it will be interesting and challenging and I am looking forward to seeing how these tensions are translated into the “rule book”. With the Unitary Plan we have for the first time in Auckland, an opportunity to integrate the planning consents and approvals process. Can we provide a framework for a liveable and prosperous city for our ultimate judges – our children and grandchildren? The challenge for all Aucklanders is to participate and clearly articulate their desired outcomes. For the planners the professional challenge is to create a plan or planning framework that is the right balance and achieves desired outcomes. For the council, the Unitary Plan is the critical tool to orchestrate the outcome – that is, a plan that enables a liveable city that is truly business-friendly. * Bryce Julyan is a technical director (planning and design) at Beca. These are his views – not necessarily those of the NZ Planning Institute Board which he chairs.